The Mayor recently announced a £15 million injection for 9 further education colleges in London that were facing sharp cuts in funding for English as a Second Language courses. The announcement in May 2007 shores up provision and does not provide extra ESOL spaces in these colleges even though need has dramatically increased due to the migration of communities like the Somali, Turkish Speaking and Eastern European groups. I have investigated and talked to ESOL providers in the last 4 weeks. I found severe shortages in some areas and further Government pressures by the introduction of heavy fees to cover administration costs, other expenses and overheads. Also, support and assistance from the National Asylum Support Service (NASS) used to be regarded as being a qualifying benefit for free ESOL courses. More worryingly, this is not the case now and more and more people are ending up on waiting lists, some of whom cannot afford the courses and others who simply cannot get a place. The Mayor has prided himself on work around integration and gave himself a pat on the back for finding money to shore up ESOL classes in 9 further education colleges in London. The reality is that asylum seekers who need English as a basic tool for integration cannot afford the courses and NASS support is now no longer a qualifying benefit for free ESOL classes. The Mayor has also given the impression that he is throwing further resources to support ESOL provision. The fact is that waiting lists are getting longer and places are limited, especially at low level ESOL classes. How this helps integration baffles me and this shows that the Mayor is out of touch on integration issues. It is time that he left his office, move out of Zone 1 and listen to further education colleges in outer London Boroughs where outward migration from Central London is having major effects. The Chinese Community Marches in Soho! was awash today with the young and the old, the angry and the sad, the shopkeepers and the restaurant owners. 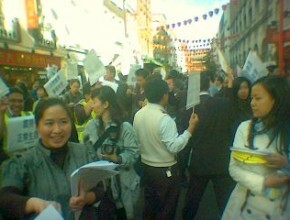 They were marching side by side and for the first time, Chinatown was awash with placards. ‘Don’t target the Chinese community’, ‘don’t penalise migrant workers’, said the voices of this normally silent community. And what had brought them out! It was a raid by the Home Office with the police and the BBC who were filming. Yes, the BBC came in on the act and were filming the arrest of migrant workers who were thought to be illegal. Restaurants were raided in Edgware in North London and employers also suddenly found themselves looking at the potential of being in prison for over a decade! Five restaurants were raided last week in the middle of the lunch hour by over 130 officers in body armour and helmets and 52 people were arrested and taken away on suspicion of being illegal immigrants. 3 were later released though the rest have pretty much been deported to Vietnam and China. Immigration rules mean that the shop owners who had employed the migrant workers may be liable to 14 years imprisonment. Yes, you heard me right, 14 years of imprisonment, a longer sentence than some sexual offenders get! Those who were arrested were refused access to lawyers and the Police’s Chinatown unit was not informed of the raids which undermined years of support and community liaison that had been built up. 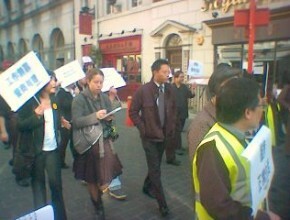 In addition to this, the Chinese community felt that it has been humiliated through the filming of the raids. So you can see why they were all out in force and why I was there, marching with them. So why did I decide to march when the voice and supportive actions of our current Mayor were missing. Well I will tell you why? Since when have we decided to overlook the basic rights of people to get access to legal support when in detention? And when have we overlooked the community police liaison groups so the first that key leaders in the community learn about the raids is when they have taken place and where individuals have been placed into custody? This goes against the norm of community policing which informs key community leaders if there are to be a series of raids in a certain area. And why was the basic dignity of people undermined by a BBC camera crew being there? These are the reasons that made me turn out in solidarity with the Chinese Community today. 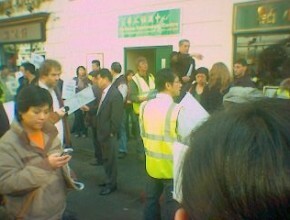 After the rally, it was clear that the Deputy Director of the Borders and Immigration Section was genuinely sorry for the BBC crew being there and made clear that in future, there would be no documentary crews and he confirmed that allegations around the lack of access to legal advice would be fully investigated. He also suggested working more closely with the Chinese community and a system to check documents with employers will also be set up. So, today was a landmark for a normally quiet and hard working community. Today, they realised that the power of peaceful demonstration can make a difference and they exerted that right. I am proud of everyone who took part in the demonstration that was around the protection of the dignity of human beings and around the protection of employers who in many instances do not know how to tell the difference between forged immigration papers and the real ones. I would like to thank Neville Farmer and Merlene Toh Emerso n for standing up with the community. 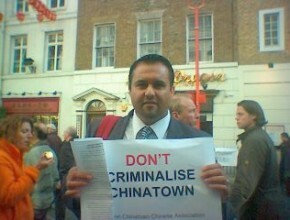 Chinatown will never be the same again and the community has had its first taste of political success. A few days ago I received a phone call from Ramesh Kallidai who is the driving force behind the Hindu Forum of Britain. A charismatic and driven individual, he has single handedly helped to form and create the Forum and has recently been appointed onto the Commission for Equalities and Human Rights. Ramesh had called to inform me that there was a young man of Muslim origin who had been robbed of his life savings and who was now desitute. The young man was sleeping on the streets and was living off charity. Yet, Ramesh had taken it upon himself to help this young man and had consistently called around trying to get someone to help. In the end, it was Ramesh’s perseverence and insistence to help a fellow human being in trouble that shone through. I assisted in trying to get the young man out of his dilemma and this incident showed me how people from different faith traditions can work together. You know, when I campaign and work on social programmes in London, I also hear about divisions between the Sikh, Hindu and Muslim communities. Yet, I have to shout out loud that the more people like Ramesh there are, the better! Our common humanity, respect for each other’s narratives and a desire for social change can act as a glue to bringing us to common ground. Spent last night at Edgware Road where many were celebrating Eid Al Fitr, the end of the fasting period for Muslims. There were many people who had come to celebrate and there were many young people hanging around the streets laughing, smiling and greeting one another – far from the ASBO generation promoted by some sections of the press. The sheer diversity of Muslims and Islam is positive and something that is wonderful to see and what was also exhilarating to see was the sheer vibrancy that comes out from such religious events. The vibrancy is something that I also feel when I attend Hindu, Sikh, Jewish, Buddhist and Christian celebrations since I am one of those who believes that spirituality can be felt within all faiths and especially where many people congregate to praise. However, last night I was also struck by something else. The levels of poverty within communities like the Somali community! It is clear that this community is one that has been hit particularly hard and integration has been difficult. High levels of poverty, family breakdowns and a gang culture has hit the community head-on and more needs to be done to assist in giving young Somalis a vision of hope and inclusion. The Somali community nationally and internationally is a hard working one; it always has been and it has survived through some of the toughest periods of its nations history. No doubt, it will be able to play a strong pro-active role in London’s development, though it needs local authorities to look at solutions of what works well with other such communities and implement it with young people. That is why I am suggesting that new innovative approaches be taken in policing in London for example. One of these bold innovative approaches is to place seconded detached youth workers with Safer Neighbourhood Teams (SNT’s). What a difference this would make to the work of these teams. It would help penetrate youth groups and reduce the juncture between the Police, Community Support Officers (CSO’s) and young people. It will also help to tackle the causes of crime as well as criminal incidents. Together we must think about integrated approaches and one that will build for the future through simple common sense solutions. Detached workers with SNT’s is one of those common sense solutions. Having spent this evening with members of the Liberal Democrat Youth & Students, I was privileged to hear Nick Clegg talk about the openess, transparency and vibrancy within the Party. Nick talked about this being a strength and it is this strength which means that we will always be the Party to talk straight and to make policy decisions that are relevant to people and communities. It is clear that Nick is more than a ‘rising star,’ he is a formidable force and leadership oozes out from every word that he utters. And what a formidable group of Parliamentarians we have; Sir Menzies Campbell, Nick Clegg, Simon Hughes, Chris Huhne, Lynne Featherstone and there are many more. I am clear about one thing. The future holds many successes for the Liberal Democrats. God knows, if we ever needed Liberalism in politics, it is now and there is no stronger team than Liberal Democrat Parliamentarians. The Mayor of London is going to be making a trip to India very soon and no doubt his visit will be used as a posturing opportunity in a vain attempt to garner support from Asian communities in the UK as the London mayoral elections draw in. Interestingly when there is an election, Ken starts to travel to far flung places in a vain attempt to gather support though this is not a knock box against Ken since he has stood up on minority issues and has been vocal on them. What I object to is the use and abuse of the same communities that he states he supposedly stands up for. Come on Ken, don’t do it and should you not be campaigning in London instead of enjoying the delights of India. Avtar Lit to stand as Mayor for London? Rumours are abound that the King of Sunrise Radio (Avtar Lit) is to stand as an independent candidate for the Mayor of London elections. Avtar who has singularly built up the station and who now owns numerous stations across the country, has stood for elections before at a national level. He stood as an independent candidate for Ealing Southall a few years ago and has a core voter base within the Asian community. I personally like his style and manner and he is warm and very receptive. He is also incredibly politically able and I salute anyone who has the guts, strength and ability to try to be a candidate. I can tell you that it pulls on all of your skills and abilities. Firstly let me congratulate you on your elevation and I am sure that you will meet many challenges ahead in the rapidly changing portfolio around communities. You have clearly worked hard in the Conservatives and are seen as a mentor to some. Well done! On a separate note, it seems that your statements that supporters of the British National Party have ‘very legitimate views’ is I am sure a slip up since people who support the British National Party may have fears around immigration, employment and possibly community safety. Yet, many of the concerns arise from resources and a perceived lack of resources for indigenous groups. It is also a fact that there are pockets where young white men are socially stuck in an environment where there are housing issues, no real employment and low aspirations and certainly they must be assisted to bring them from the margins into the mainstream. They should have the opportunities to make a life for themselves, feel empowered both socially and financially and more than ever, an increase in income and life chances will reduce the anger and exclusion that they may feel. Some of these fears need to be addressed and quick. And many of them are not based on facts and to legitimise perceptions is not helpful, nor constructive. I personally think that it is important to respect the views of people whether I agree with them or not, though it is a duty on us all to engage and inform those who are disaffected. Our country needs sanity in politics, less of the emotional and more of the factual, less of the knee jerk and more of the well researched (political positions). So may I ask that as we move towards an election, that race does not become a major topic as it seems to have done in the last 2 elections. Rational politics – yes! Irrational debates – no!